Featuring a ball-bearing live center, heavy-duty steel knockout bar, and onboard storage for easy access to adjustment tools, the Delta 46-460 industrial 12-1/2-inch variable-speed midi lathe handles even heavy-duty jobs with ease. 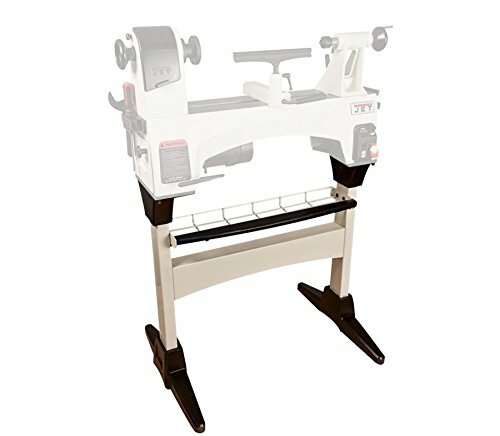 Ideal for professional woodworkers, this machine gives you fast, smooth results and offers variable speed for consistency and control. Industrial 12-1/2-Inch Variable-Speed Midi Lathe At a Glance: Powered by a 1-horsepower max, 1,725-rpm motor for robust performance 12-1/2-inch swing capacity--the largest in its class Variable speed with three pulley-speed ranges Includes 6- and 10-inch tool rests and 3-inch face plate Backed by a five-year warranty With a 12-1/2-inch swing, the 46-460 has the largest capacity in its class. View larger. The extension bed increases the overall bed length to 42 inches. View larger. Powerful Motor and Variable Speed for Consistency and Precision Powered by a 1-horsepower max, 1,725-rpm motor, the Delta 46-460 industrial 12-1/2-inch variable-speed midi lathe provides a 12-1/2-inch swing capacity--the largest in its class. Variable speed with three pulley-speed ranges makes it easy to select the required speeds needed to turn a project without changing belt position. Forward and Reverse Provides a Superior Finish For accuracy and precision, forward and reverse functions allow the turner to achieve a superior finish. As woodworkers know, sanding a turned piece with the grain causes the wood fibers to lie down and remain rough while sanding a turned piece against the grain will shave the wood fibers smooth. Rotating the turned piece in both directions is the way to achieve a truly smooth finish, yet it often involves remounting the work piece backwards--a time-consuming and often impossible task. With the 46-460, this process is simplified. With a quick flip of the switch, it's done. Patented Belt-Tensioning System for Fast Speed Changes and Longer Tool Life A patented belt-tensioning system makes for quick speed changes, and sets the belt at the correct tension every time for maximum power transfer and longer tool life. And large objects are no problem with the six-groove belt that provides superior power for effortless turning. 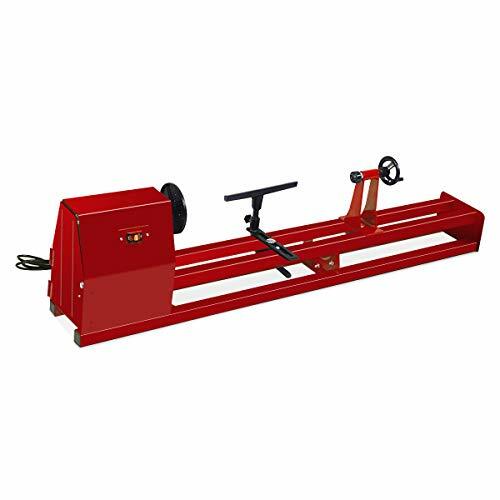 Cast-Iron Construction for Durability and Strength Durable and stable with all cast-iron construction, the 46-460 also includes a three-inch face plate, and 6-inch and 10-inch tool rests for tool support in a variety of turning applications. 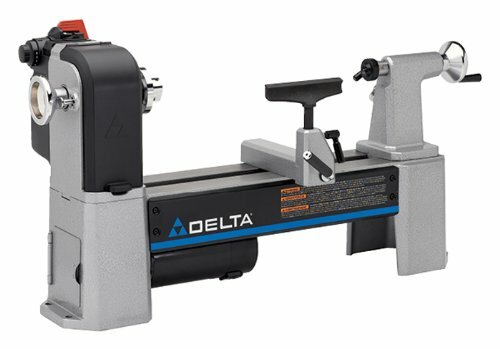 Warranty Information The Delta 46-460 industrial 12-1/2-inch variable-speed midi lathe is backed by a five-year warranty. 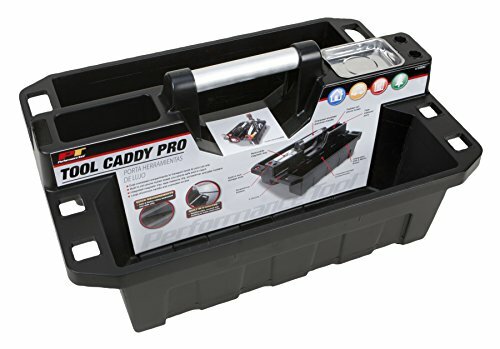 What's in the Box 12-1/2-inch variable-speed midi lathe, 6-inch and 10-inch tool rests, chrome 3-inch face plate, tool rest base, knockout bar, live center, wrenches, and manual. Variable speeds let you perform a variety tasks without changing the belt position. Forward and Reversing function allows the turner to achieve a superior finish. Sanding a turned piece with the grain causes the wood fibers to lay down and remain rough. Remember when you could turn your own pens? 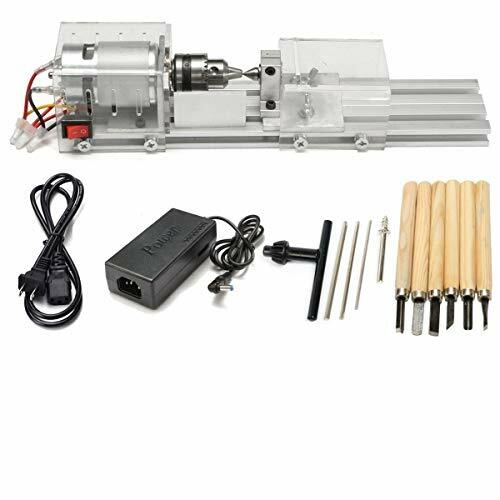 Fill your house with as many pens as you can with the WEN 8-Inch by 12-Inch Variable Speed Midi Wood Lathe. Adjust the variable speed anywhere from 750 to 3200 rotations per minute. 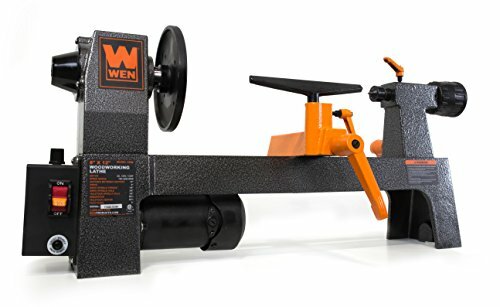 The WEN 8-Inch by 12-Inch Variable Speed Benchtop Wood Lathe features an MT1 spindle and tailstock taper to tightly grip workpieces, two tool rests (4-1/2 inch and 7 inch) to provide needed support for chisels and tools during operation, and a 2A motor to keep things turning. The easy-to-use lever clamping system makes adjustments to both the tool rest and the tailstock simple and precise. 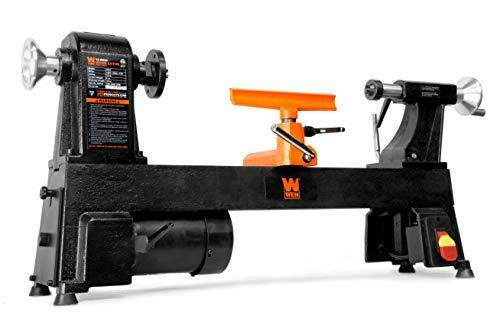 The WEN Wood Lathe also includes a flat wrench, a headstock spur center, a tailstock cup center, a knockout rod and a 5-inch faceplate for non-spindle workpieces. And, because its a WEN product, your lathe comes backed by a two-year warranty, a nationwide network of skilled service technicians and a friendly customer help line. Remember when you could turn pens, chess pieces and more? Remember WEN. The JET 1221VS is different from anything we've made before. In truth, it s different from anything that anybody has ever made before. The design is better. The features are better. The entire turning experience is better. And it all focuses on one concept Control. 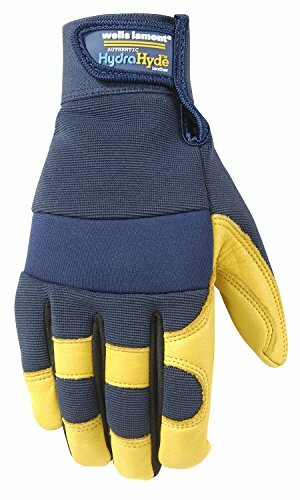 Now you can work harder longer with these patented HydraHyde gloves from Wells Lamont. Not only will they keep your hands dry with a water resistant full grain leather palm and a water resistant spandex back, but they will fit great with an adjustable wrist closure and will remain tough with reinforced fingertips. Full-grain water resistant leather palm with water resistant spandex back. IDEAL FOR: All-Purpose, DIY Projects, Tool Use, Landscaping, Demolition, Construction, Fencing, Equipment Operation and more. Adjustable wrist closure and reinforced fingertips. Lightly padded neoprene knuckle insert. Navy spandex back with saddletan grain cowhide leather. Wells Lamont - Stubborn About Quality since 1907. Jack-of-all-trades design- ideal for jobs requiring full range of motion such as landscaping, construction, demolition, farming, maintenance, DIY projects, and more! Remember when you could turn your own table legs? 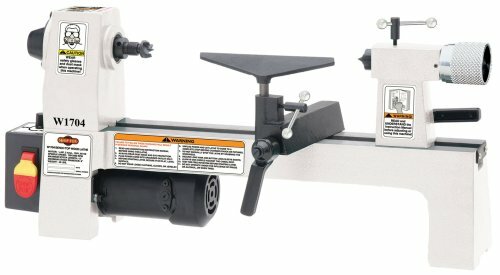 Fill your house with as many table legs as you can with the WEN 12-Inch by 18-Inch 5-Speed Wood Lathe. With 5 different operating speeds, you ll be able to turn workpieces at 520, 900, 1400, 2150, or 3400 rotations per minute. The 4.5A motor provides maximum torque while the sturdy 70+ pound build prevents walking and wobbling during operation. This beast of a lathe features an MT2 spindle and tailstock taper to tightly hold your workpieces, along with a 7-7/8-inch tool rest for chisel and tool support during operation. The easy-to-use lever clamping system makes adjustments to both the tool rest and the tailstock simple and precise. 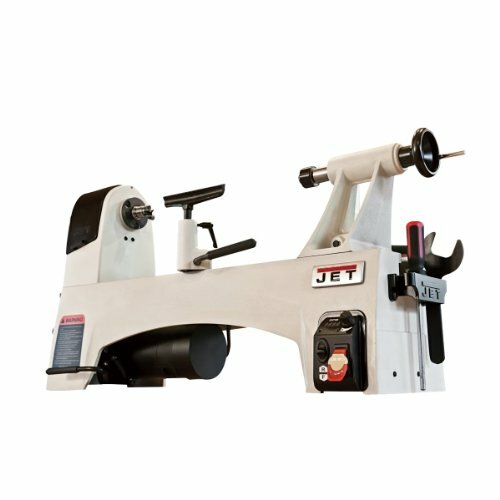 The WEN Wood Lathe also includes a headstock spur center, a tailstock cup center, a flat wrench, a knockout rod, 2 hex wrenches (3 mm and 5mm), an accessory holder, and a 3-1/8 inch faceplate for turning bowls, cups and other non-spindle workpieces. And, because its a WEN product, your lathe comes backed by a two-year warranty, a nationwide network of skilled service technicians and a friendly customer help line. Remember when you could turn pens, bowls, cups, chess pieces and more? Remember WEN. Speed of revolution:4000-8000rpm(7 stage speed regulation). 1.If the user does not have lathe base experience, when used, should follow: low speed, slowly, cautiously and other security operations. 2.The speed can be adjusted in 4000-8000R, cut wood should not exceed 4000, grinding can use higher speed. 3.Drill chuck axis, the axis of the wood, the tailstock center axis of the drill should be in a straight line, or need to adjust the nut. 4.If not a cylinder, the speed should be reduced. 5.Tailstock bearing without lock tight. 7.If you do not really understand the operation, it is best to consult a professional person. Designed for the home DIY enthusiasts, small and portable, strong power, not suitable for mass production or commercial use. High-precision, stability, low noise, aluminum alloy materials, CNC machining. Thick aluminum base, acrylic dust cover motor. Transparent plexiglass shield, super convection cooling holes. Variable speed, large torque ball bearing motor. This sturdy stand, with a convenient storage basket , takes the JET 1221VS lathe from a benchtop lathe to a stand-alone lathe. Do you want a Lathe that s as versatile as your turning? the 1440 Lathe from Jet can be tailored to accomplish a wide range of projects. With a sliding and pivoting headstock, variable speed, and many other great features this Lathe meets the needs of Woodturners. Experience the 1440 Lathe and see how versatility takes shape. This grinder setting jig is used to set proper grinding angles for four categories of high speed steel wood lathe tools: Roughing Gouges, Parting Tools, Skews & Bowl Scrapers. I've named it the "Quad Setting Jig" since one jig sets the correct angels for 4 woodturning lathe tools. 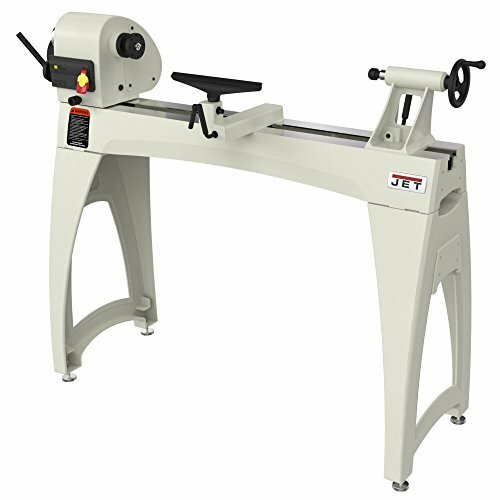 This offer includes the Quad-Setting-Jig only and does not include any sharpening system or lathe tool. Colors may vary. The Quad Setting Jig is calibrated for grinders with 8" grinding wheels and will not be accurate when used with any other size of grinding wheels. The preset angles are suggested for specific tools and work for most folks in most situations most of the time. 100% Made In America by a wood turner for wood turners. Large torque ball bearing motor. 2.Drill chuck axis, the axis of the wood, the tailstock center axis of the drill should be in a straight line, or need to adjust the nut. 3.If not a cylinder, the speed should be reduced. 4.Tailstock bearing without lock tight. 5. When using a knife, locking the bottom of screw, location should be away from timber 1-1.5cm. Superbuy 1/2HP 4 Speed 40" Power Wood Turning Lathe 14" x 40"
This lathe is a machine tool which spins a block of material (wood) to perform various operations such as cutting, sanding, knurling, drilling, or deformation with tools that are applied to the work piece to create an object which has symmetry about an axis of rotation. And with 4 adjustable speeds: 1100/1600/2300/3400RPM, you can tackle various projects with different speed, contributing to power saving and better accomplishment. Besides, the compact size makes it ideal for home wood working use, which can be perfectly set at your house to do some wood pattern projects and handiwork, such as straight fluting, grooving, drilling, layout, and more. In addition, with 40 inches distance from the center, the lathe give you enough space to do wood work while maintaining a low profile on your workbench, allowing you work with larger pieces for great handiwork. Don't hesitate to buy it. Solid and Steady Frame Made of solid steel, the frame is steady and strong enough to make your machine stable, which can hold your wood projects. And the stable frame can help to reduce the vibration when operating the machine. 4 Speeds Adjustable Designed with adjustable 4 speeds: 1100/1600/2300/3400RPM, you can tackle various projects with different needs, contributing to power saving and better accomplishment. And the 1/2 HP setting is powerful. 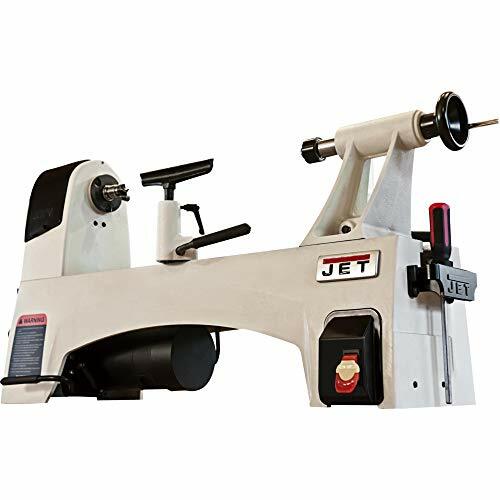 Perfect for Home Use Overall Dimensions of 57.2 X 9 X 14.9 and complete accessories, the lathe is compact, allowing fit in tight space, which can be perfectly set at your house to do some wood pattern projects and handiwork, such as straight fluting, grooving, drilling, layout, and more. 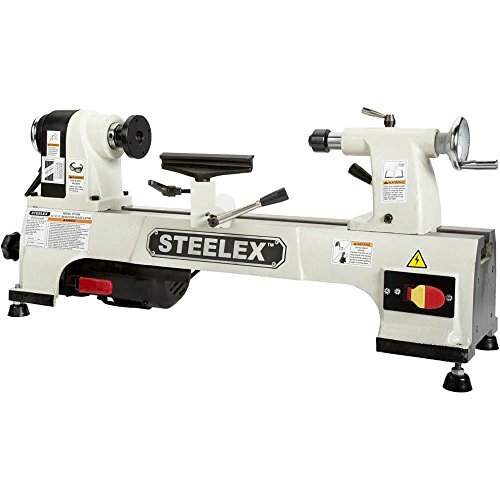 With Great Working Space With 40 inches distance between the center, the lathe give you enough space to do wood work while maintaining a low profile on your workbench, allowing you work with larger pieces for great handiwork. Accessory Options for Versatility With several accessories available to customize the lathe, you can tailor it to fit your different needs. 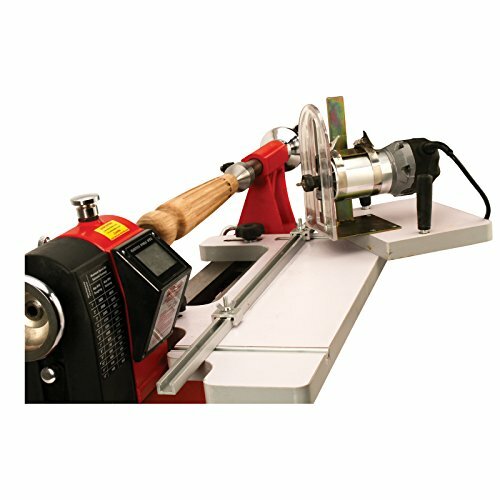 With the versatile wood turning lathe, you can improve the accuracy of your craft. NOVA 46300 Comet II 12 Inch x 16 1/2-Inch Variable Speed Midi Lathe is the most versatile & innovative smaller lathe on the market today. Portable and space saving, yet delivers the capacity and rugged stability of larger machines. Small, space saving design means the NOVA Comet II Midi is a great choice for a multitude of projects. It s at home as the primary or secondary lathe in a multi-functional workshop, or great for those who travel a lot for their hobby or who teach/demonstrate frequently. Its powerful 3/4HP electronic variable speed motor offers a wide speed range from 250-4000rpm. With a super low speed, up to a super high speed, the NOVA Comet II midi lathe is the perfect choice for a variety of projects, from pens to bowls and spindles.The forward and reversing switch offers additional flexibility for a superior finish. With its 12" swing capacity over bed and 16.5" between center capacity, expandable to 41" with the optional bed extension accessory, you can turn a wide variety of projects. Improvements to previous models include: strengthened reinforced composite guard, the guard now has a rapid access latch for even faster and easier access, the on/off switch has been improved to make it faster and more positive to switch on and off and is fitted with a no-vault release for additional safety. The 3 Step Pulley System offers different speed ranges while providing maximum flexibility.The middle step usually provides enough range for most wood turning applications, however the additional two steps provide more torque when needed for the more demanding projects. The Comet II has exceptional structural strength, with its solid cast iron construction throughout delivers optimum strength and rigidity while absorbing any vibration. The result, an exceptionally smooth turning experience with less time spent in the finishing process. Finally, the motor housing has been changed to a robust die cast housing. 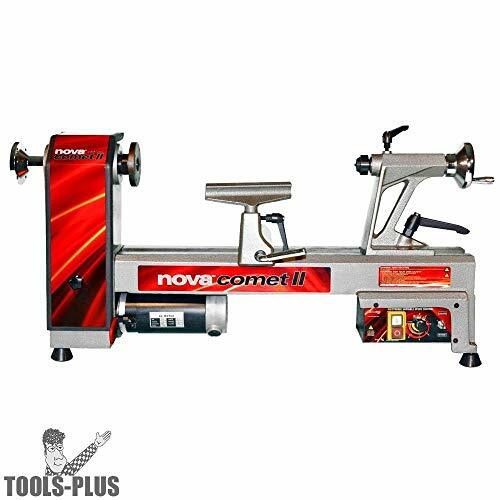 This updated version of the NOVA Comet II Midi Lathe delivers an exceptional turning experience.By adding the optional accessories you can transform your lathe into a total wood working station. This patented world first approach to versatile Midi Lathe design delivers maximum flexibility for the lathe owner, allowing the user to consolidate key wood working and wood turning functions into the single machine, saving space, time and money. Lathe available in 1"8TPI thread. Standard equipment: 3/4HP variable speed motor, 3" faceplate, hand wheel, 6" tool rest, 2MT Drive center, 2MT Live Center, knockout bar, manual and fastenings. Designed by Teknatool International, innovating since 1955. Backed by a full replacement 1-year warranty on motor and electronics and a further 2-Year limited warranty on all parts excluding motor, electronics, consumables, for a total of 2-Years limited warranty. Call our customer service center on 727-954-3433. All cast-iron construction and a 1/2 HP motor provide plenty of stability and power to turn bowls up to 10" wide and spindles up to 15" long, or 38" long with the optional bed extension. This stable Benchtop wood lathe has six speeds from 480 to 4023 RPM. Includes live center, spur center, 3" faceplate, and tool Rest. With our Lathe Mounted Fluting Guide (Router included) you can add style, design, and a new dimension to your turnings. 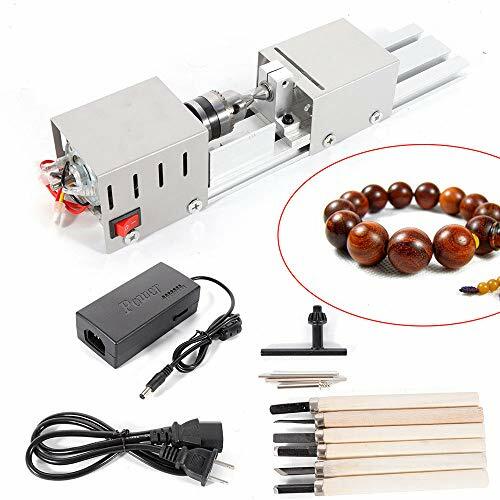 This accessory allows you to decorate your spindles, vases, handles, and other turnings with decorative flutes - taking advantage of that wonderful indexing feature on your lathe that sat idle until now! 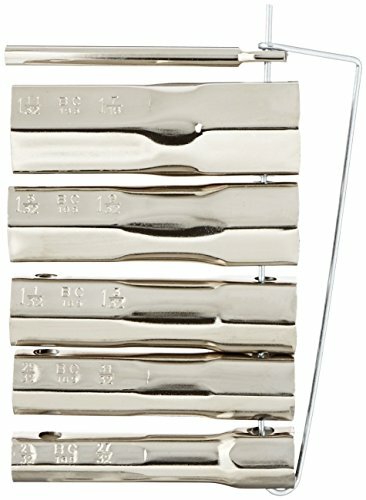 Make flutes or perfectly straight cuts or tapers with a professional flair with this versatile guide. The guide's platform mounts to the bed of a split bed lathe 18 in. or longer. It includes a support / guide for a trim router that adjusts to cut flutes on lathes with swings from 8 in. to 16 in. Use V or Cove Router bits to cut your flutes, or use a straight bit for rounding. The system includes: Guide platform, Trim Router transport guide, Rocky30 Trim Router, and (1) Core router bit. Lathe not included. 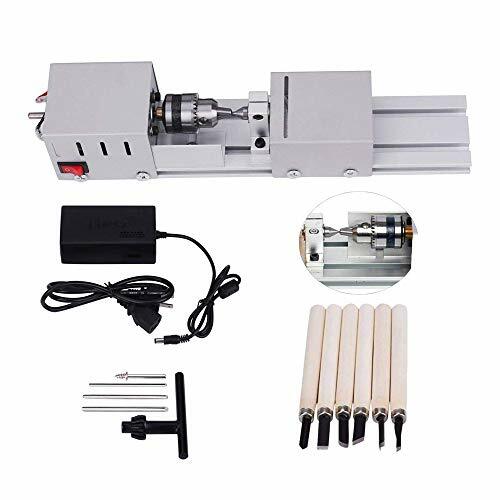 System includes: guide platform, trim router transport guide, Rocky30 trim router, core router bit. Take advantage of that wonderful indexing feature that came with your lathe. Add style, design, and a new dimension to your turnings.